For the most unforgettable experience, stay overnight in Borodale House. This Victorian-era villa incorporated within The Distillery has been beautifully restored into a luxury whisky hotel, executive lounge and visitor centre. 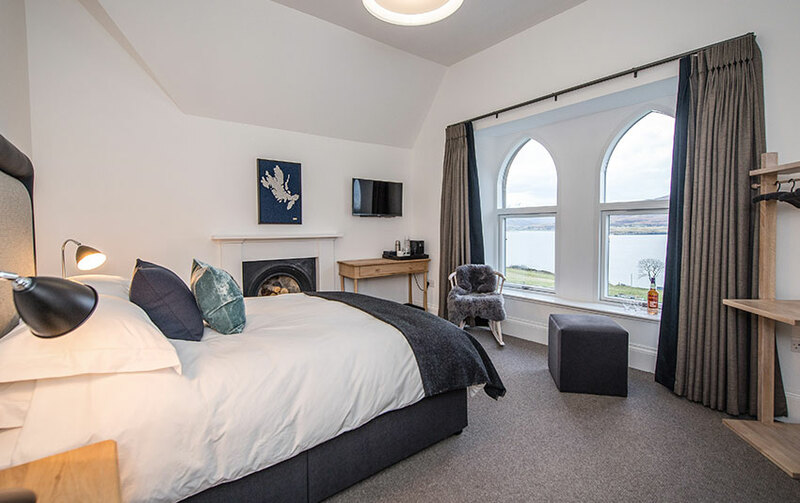 Designed by local architect Olli Blair and renowned Scottish designer Anne Hunter, Borodale House offers six exclusive en-suite bedrooms well-appointed with luxury amenities and comfort and arguably the best view from any distillery in Scotland over to the Isle of Skye. We are perhaps the only distillery in Scotland that provides luxury accommodation within the same building as a working distillery. As well as staying overnight why not enhance your stay by taking a guided tour of the distillery, ending with a whisky tasting. 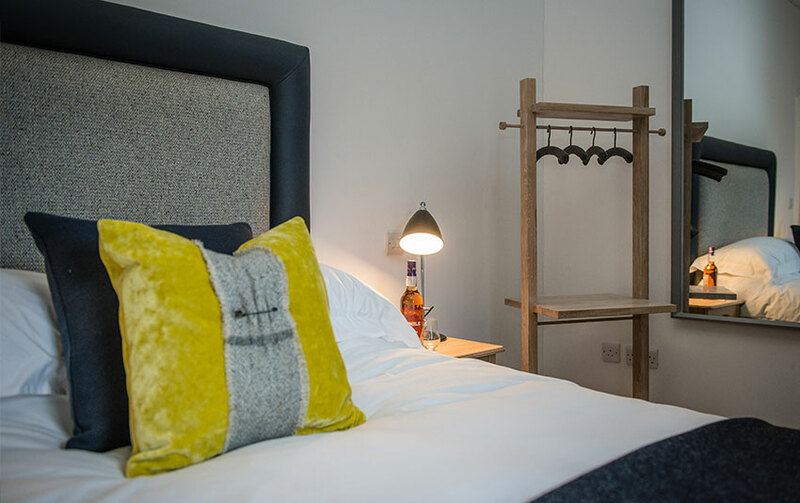 Three of our bedrooms are blessed with stunning views of the Cuillin mountains on the Isle of Skye, while the other three overlook the production yard of the distillery. Located between the ferry terminal and Inverarish, the main village on Raasay, our distillery is well placed for exploring the island’s breath-taking natural beauty and historic sites, including the iconic Dun Caan mountain, Brochel Castle and the enigmatic Calum’s Road. 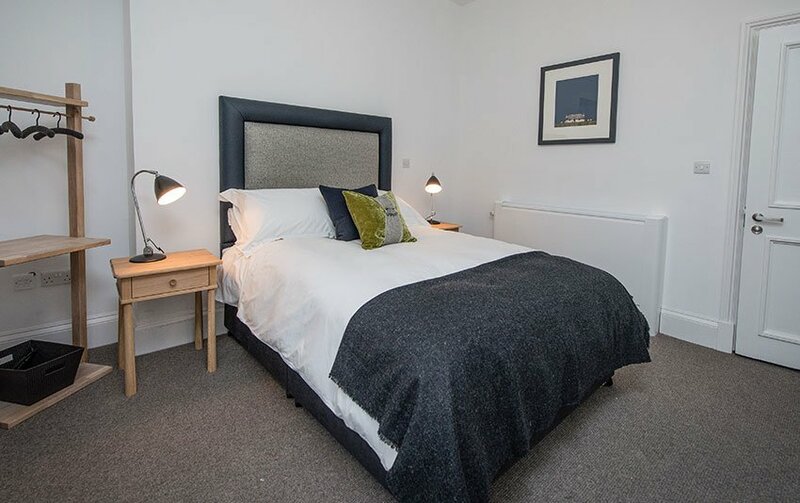 Designed for relaxation and comfort, our rooms provide the perfect retreat for your Hebridean adventure, featuring a flat-screen Freeview TV, Nespresso tea & coffee machine, feather pillows and duvets with luscious The White Company linen. 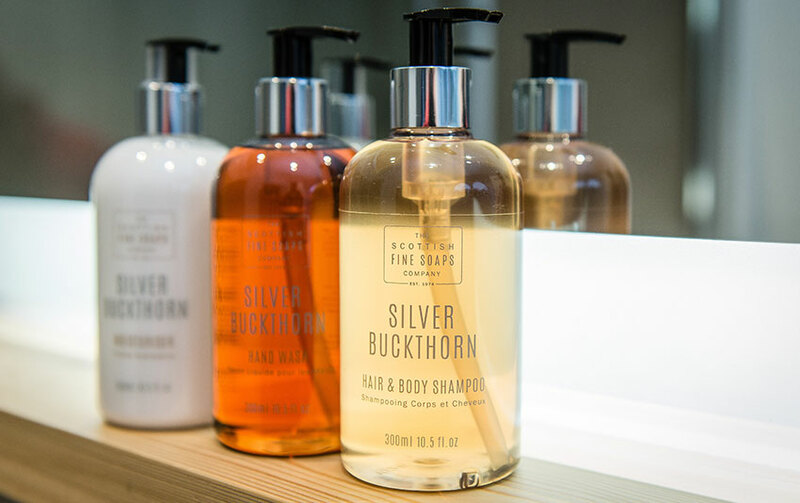 Our rooms also feature a private en-suite facility with rain shower, fluffy towels and luxurious toiletries sourced from Scottish Fine Soaps Company. It is hard to review the stay at the distillery without reviewing the island of Raasay itself. Though the distillery has brought new life to the island, a sense of piece and calm pervades everything. The distillery and its accommodation commands breathtaking views across the sound to the Cuillins on Skye, and the architecture allows one to take full advantage, whatever the weather. We were blessed with a fantastic day, full sun and a comfortable breeze to make walking a pleasure. I have seen Raasay with other faces, but could never tire. The distillery offers very comfortable, modern accommodation, and the most peaceful night’s rest one could ever hope for. Breakfast is simple, but fresh and faultless. There is no restaurant, most visitors will take other meals in nearby Raasay House which boasts an excellent restaurant as well as good pub meals in its bar. This is not a place for people looking for bright lights and bustle (even by Hebridean standards) but somewhere to enjoy the slow life. Staff are exemplary, and have the time to take out to talk. About the distillery, the island, the weather, life in general – but never intrusive. We came from London reliant only on public transport. This works. Bicycles are available for hire from the hall if you wish to explore. 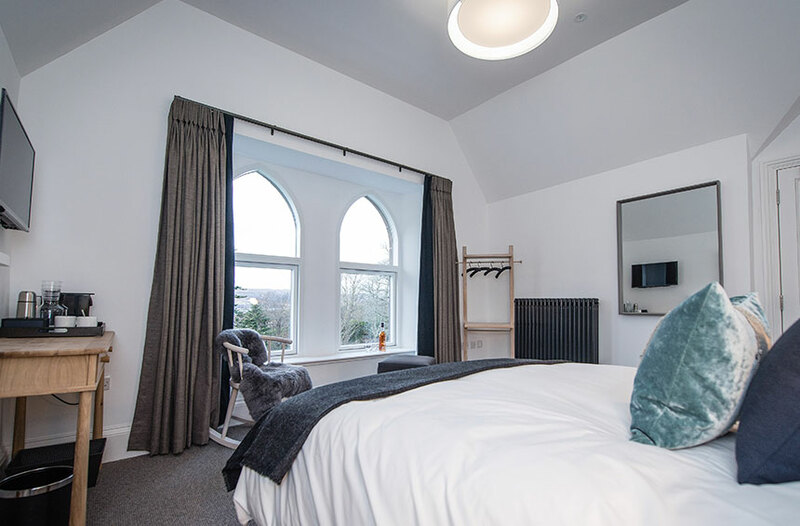 There is a concise and well chosen library for guests, the view from the window is better than the telly, though TV is provided in the bedrooms in the unlikely event you want it and wifi that works if you need it. Take a walk in the slow lane, you won’t regret it. Our first visit to stay on the beautiful island of Raasay and we were fortunate enough to stay for two glorious nights at the distillery. It is in the fabulous setting just a short walk from the ferry terminal. Oozes luxury and our room was a double overlooking the sea and hills. Bed exceptionally comfy and linens silky smooth. 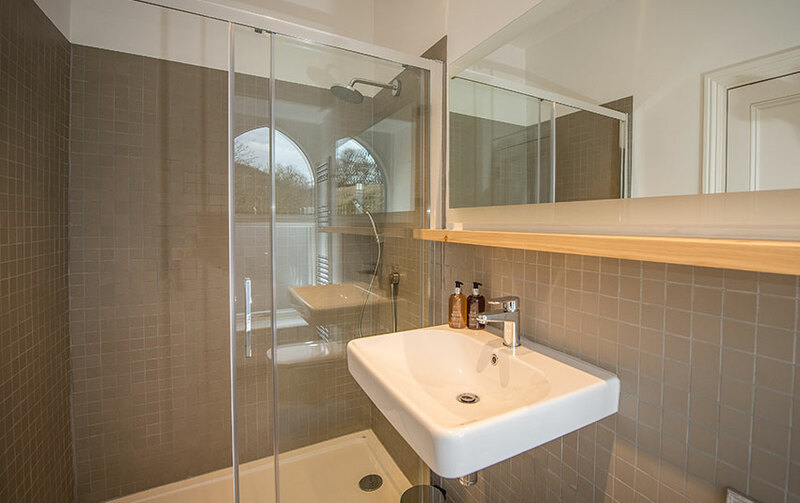 Toiletries from Scottish fine soaps, flat screen tv in room but you don’t need tv with the ever changing scenery outside. Coffee maker and tea in room with lovely nibbles. An amazing trip to raasay to visit the accommodation at the isle of raasay distillery From the moment we stepped off the ferry we were well looked after by Barbara and Calum. There are few distilleries you can actually stay at but Raasay is one. Make this something you do in 2018. We stayed for two nights because Skye was full. Turned out to be wonderful and fun to stay at a distillery. Our room was comfortable but a little small. It is a very new hotel so they are still working on some of the details. The building is beautiful and so are the rooms. Including one drink of their ‘While We Wait’ whisky was a treat! They were friendly and very helpful. They wanted to make sure we had everything we needed. It is worth the trip and Raasay is a great place to visit. 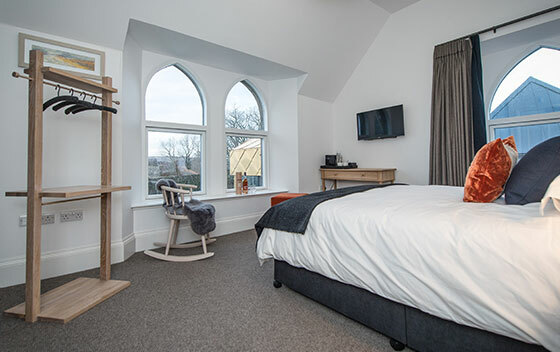 Lovely room with great views, friendly and helpful staff and a relaxed atmosphere made for a very pleasant stay. The distillery tour was also excellent and led by a very enthusiastic and knowledgeable guide. Would highly recommend both to anyone wishing a break away. Comfort, views and whisky all make a great stay! Great facilities, beautiful views, superb breakfast. Love the honesty bar. We had a great time staying at the distillery. Facilities were brand new and modern. Breakfast included was good. Staff were extremely helpful. Rooms were very clean and modern. The views are amazing! Very welcoming and helpful staff, very clean facility. You won’t be disappointed if you like whisky, beautiful scenery, and magical places. Amazing staff on a beautiful quiet island with spectacular views. We absolutely loved this place! Perfect location, very comfy and clean. We felt welcomed from the start! Thank you Barbara for spoiling us :) We will be back! Guests staying at Raasay Distillery will have access to our executive lounge located on the ground floor with a fully stocked bar, teas, coffees and snacks. For those wet days, reading materials and games are also available in the executive lounge. Free WiFi is available to guests throughout the building. Existing Na Tùsairean Club Members: Please visit our Na Tùsairean Whisky Club page for information on how to book your stay at the distillery. Sit back and enjoy our continental breakfast, served in the Gathering Room with stunning views over the Cuillin hills of Skye. Choose from a range of freshly baked pastries, ham, cheese, cereals, fresh fruit and yoghurt. A selection of teas, coffee and fruit juices are also on offer. Getting to Raasay is easier than you might think, despite it being a remote Hebridean island. By ferry from the Isle of Skye is the only way to reach Raasay. On the Isle of Skye continue your journey to the ferry terminal at Sconser. Here you step aboard the CalMac ferry and enjoy the scenic 25-minute sail across to Raasay. For more information on how to get to Sconser Ferry Terminal, visit our helpful journey planner.